Spending a little time planning the flow of users through your social spaces can make a big difference towards learning the benefits that these spaces bring to a business. Here is a case study from a recent project by Aquest Design. 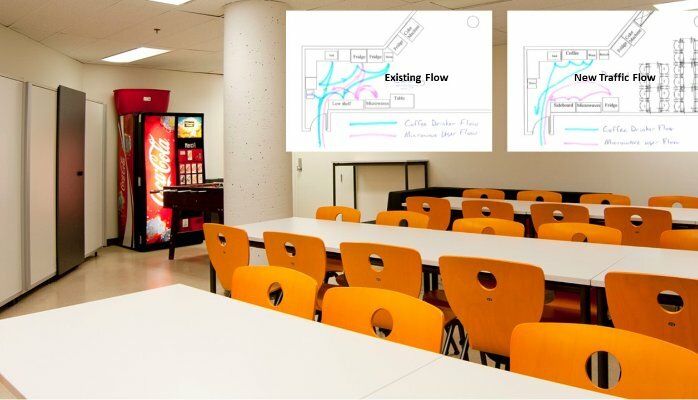 Situation: A Montreal software development company needed to refurbish one of their lunchrooms to make it more usable for employees and to line up with their company image. The entry was too small for the number of users. Everyone gathered around the coffee machines. The fridges and microwaves near the entry and the tables further in would hardly get used except at lunch time. Action: Tracking the flow of users at peak times, we learned that there were two categories of users that hardly overlapped – coffee drinkers and microwave users. Aquest Design proposed reorganizing kitchen equipment to keep these users separate. Using mobile service carts instead of fixed counters meant further adjustments could be made later. Moving vending machines further into the room along with a Foosball table helped draw employees away from congested areas. Result: The usefulness of this corporate social space has increased significantly. The design and colours chosen for the Network tables and Compass-VF chairs help reinforce the company brand during relaxation times.